It’s our second episode and we still don’t have a name for our podcast. But you can hear us argue about it! We talk about some of the books our kids are reading this summer, about the abuse of language. We also talk about this article and whether VBS is healthy for kids. Speaking of kids, watch out for the British swearing! We hope you enjoy being a fly on the wall as David, John, and Amanda argue about this and that. 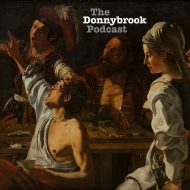 Episode 19: Is Liturgy Like Painting By Numbers? The Donnybrook Podcast, Proudly powered by WordPress.